If you own a local business, you’re well aware how online reviews can impact your bottom line. Studies have found that 90% of consumers say their buying decisions are influenced by online reviews. That’s why making online reputation management a key part of your marketing strategy is critical to your success. And, as with many similar undertakings, there is a right way and wrong way to go about your approach. Below is a list of 10 “do’s and don’ts” for managing your online reviews. Online reviews are not going away. And, ignoring or dismissing them will cause you to miss out on a significant revenue opportunity. Your best strategy is not just to embrace, but leverage online reviews to improve your reputation and grow your business. Online review management should not be an improvised effort. 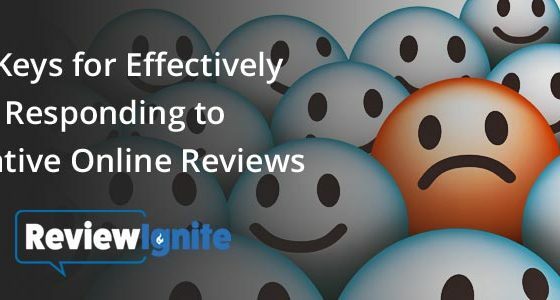 Businesses should establish who in the organization is responsible for online reviews, guidelines for how to respond to reviews, problem escalation procedures and a methodology for using feedback to improve the customer experience. It’s important to respond to all reviews that your business receives. Don’t reply to negative reviews only. Positive feedback from your customers should be acknowledged as well. Saying a quick “Thanks for your kind comments” goes a long way to getting repeat business and attracting new customers. Having a steady flow of online reviews is important for your business. Reviews are user generated content which helps boost local SEO. In addition, potential customers prefer “fresh” reviews as opposed to ones that are months (or years) old. How do you get more reviews? Simply ask your customers. In a recent survey, 7 out of 10 consumers say they would leave an online review if asked. Many businesses do a good job responding to reviews. But when you scroll through their responses, it sounds like PR-speak with no resolution. You see phrases like “Our goal is to deliver…” or “We have a culture of …”. That’s not fixing the problem and actually makes the business look worse. Your response should include what you have done or will do to fix the problem. You should never reveal the names of, details of your relationship with or other specific information about your clients when responding to reviews. (Even if they reveal such information in their original post.) This is especially true for health care providers. A patient’s “individually identifiable health information” is defined as protected health information (PHI) under the HIPAA law. 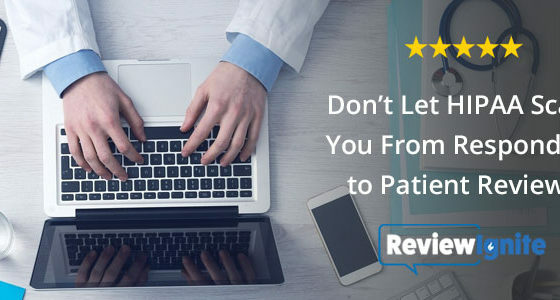 And, you must be careful not to reveal a patient’s PHI when responding to online reviews. Also, it’s against the law to even acknowledge patient relationships, much less their treatments and/or diagnoses. Your objective should be to respond to reviews once, keep it short and include a direct contact method (preferably a mobile number) for the customer to contact you to resolve any issues. Getting into a back-and-forth conversation online with a reviewer is not a good idea. The business rarely comes off looking good in this situation and you end up doing more damage to your reputation. Businesses should make a point to discuss customer reviews with their employees on a regular basis. After all, they a play a key role in building your brand reputation. It’s also a great opportunity to reinforce why delivering a great customer experience is so important. The customer comments in online reviews are free market research. Businesses should take advantage of this information by analyzing the data on a quarterly or annual basis. The results can give you keen insight to improve business operations and the customer experience. There are hundreds of online review sites and business directories on the web. Managing your online reviews in this environment manually is labor intensive and costly. Online reputation management firms can provide the services you need to protect your brand reputation at a reasonable investment. Whether positive or negative, your customers are taking their time and effort to leave a review for your business. Ignoring them is like a slap in the face. Online reviews are an opportunity to engage with your customers. Responding shows that you care about them and their experience with your brand. No one likes getting negative reviews. It’s understandable for business owners to be upset when they receive a bad review. If that’s the case, the worst thing you can do is respond in this state. Take some time to cool down before you respond. Your approach should be to read the review, step back and process the situation then compose a polite, constructive response. You should respond to reviews as soon as possible, but no later than a few days after being posted. A fast response shows that you appreciate your customers and care about their concerns. The other reason to respond quickly is that it’s important the business owner be the first to post a reply and not be drowned out by other replies. If you don’t have any reviews or are just starting a business, it’s tempting to write reviews about yourself. Don’t do it. Not only is it wrong, it goes against Federal Trade Commission (FTC) guidelines. Additionally, if the review site finds out that you are posting fake reviews, they will likely ban you. And, if the public finds out, your brand reputation will really suffer. Incentivizing customers to leave positive reviews for your business is a paid endorsement – which is unethical. The risk of being banned by review sites, running afoul of the FTC or ruining your reputation to “buy” 5-star reviews is not worth it. Going back-and-forth or arguing with a reviewer is never a good idea and can make you look worse in the eyes of the public. Your objective should be to respond online once and handle future conversations via face-to-face meeting, phone or email. If the customer leaves a very long post with several points, only respond to each point if you can do so in a constructive manner and without violating their privacy. This means don’t use the same wording repeatedly when responding to reviews. Good review response practice includes reading the original post and customizing your response to that customer. You should have a process for replying to reviews, but not a “fill-in-the-blank” template. We consumers are a skeptical bunch. Nobody’s perfect. And, seeing a business with all 5-star reviews can be viewed as a red flag. 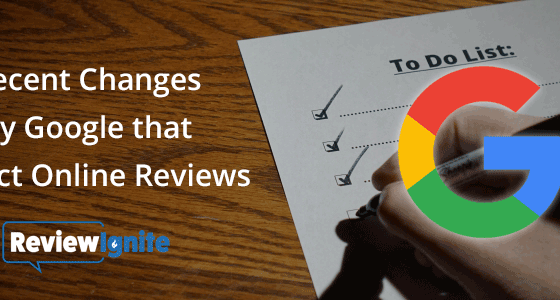 Having a few negative reviews is not a bad thing (as long as you are addressing the problem). A recent survey shows that 73% of consumers say that reviews more than 3 months old are no longer relevant when it comes to influencing their purchase decisions. To generate more reviews, businesses should encourage their customers to leave reviews. Attempting to manually monitor the many review and social media sites on the web is very labor intensive. Even with all the free online tools available, the task of monitoring reviews is daunting and expensive. Find a reputable, reasonably priced online review management firm to help you manage your online reputation. Need help managing your online reviews? ReviewIgnite is here to help! Online review management represents a great opportunity for businesses to both improve brand reputation and boost sales. Using our online review management dashboard, you can access an effective, easy-to-use solution for you and your staff to start monitoring and leveraging the power of online customer reviews today. Simply contact us or click on the “Request a Demo” link below.